If you are a world traveler, it is very likely that at some point in your life you will make the decision to visit Machu Picchu. This famous destination is listed as a must-see site on every major travel Website and travel publication. What level of comfort will make your journey most enjoyable? Best time to visit Machu Picchu? How long should you stay in Cusco? Which train station should you depart from to Machu Picchu? How many days should you spend at Machu Picchu? What should you schedule to do at Machu Picchu? Should you hike the Inca Trail? Recently, I traveled to Machu Picchu with my two daughters, and I can personally attest that it is place filled with wonder and awe. The journey and the site are experiences we will always fondly treasure. There are really no new words of praise that I could write that would add much to the growing list of many who have made this journey before me. But one unique contribution I can add is to suggest that when you do make the decision to take this journey, there are many choices you will have to make. Planning a trip to Machu Picchu, researching your options, choosing wisely, and making plans can greatly enhance your experience and elevate your trip to the status of legendary. The following is a short list of questions you should consider before you finalize your Machu Picchu plans. Most tour companies book group tours at 3-star hotels. We upgraded our hotels to 4-star hotels anticipating that we might need a higher level of comfort and more quality food choices for breakfast. This proved to be a good decision. The altitude of the Andes Mountains affected us more than we anticipated. It never stopped us from doing anything, but it was always a minor discomfort that affected our trip. We didn’t find ourselves gasping for breath or reaching for oxygen tanks, but we did experience headaches, lightheadedness, and more fatigue than we anticipated. The biggest problem we experienced occurred when trying to sleep. Often we found ourselves breathing heavily and waking up at odd hours. After 7 days in the high altitude, we never fully adjusted to the climate. Comfortable hotels helped to ease the adjustment and make it less of a problem. Being careful about what we ate and taking advantage of good breakfasts definitely reduced time lost to sickness. The rainy season in Peru is from November to March which is also the warmest weather. The heaviest rain is usually in February. The site is more busy in the summer from June until August. Like so many places if you can schedule a visit in shoulder season you will have a better and cheaper experience. Cusco is the closest airport to Machu Picchu so most travelers will pass through Cusco. How many days to spend in Cusco is a common question from travelers. We booked two days in Cusco before our trip to Machu Picchu, one night at Aguas Calientes (near Machu Picchu), and then two days in Cusco after Machu Picchu. This combination seemed to work well and if we had more time, we would have spent another day in Cusco. Cusco is just a fun place from which to stage your journey to the Sacred Valley and Machu Picchu. There is also a lot of history and culture to be experienced in Cusco. After visiting Machu Picchu, we were thankful that we were returning to Cusco, and we compiled a list of things we missed on our first visit. We didn’t get to see everything on our list, but we were glad that we had two extra days to see many of them. Should you travel to Machu Picchu from Cusco or the Sacred Valley? On the day you go to Machu Picchu you will travel there by Peru Rail. We stayed in Cusco and thought we would take the train from Cusco to Machu Picchu. Much to our surprise, we began our day with an hour and a half drive from Cusco to the Sacred Valley. This was tough, because we had just taken this drive in the opposite direction the night before after touring the Sacred Valley. We spent three hours needlessly driving through the mountains near the Sacred Valley. Rethinking our itinerary, it would have been best to spend the night before we left for Machu Picchu in the Sacred Valley near the train station at Ollaytaytambo. If we had done this, we would have been able to retire early and get a long rest before departing early in the morning for Machu Picchu. We just assumed our travel company would make a good decision for us. In retrospect, we should have made this decision. Which station you leave from should depend on where you stayed the night before. Most people depart for Machu Picchu from either Poroy Station near Cusco or Ollantaytambo Station in the Sacred Valley. The train ride from Poroy to Machu Picchu is a little over three hours. The journey from Ollantaytambo Station to Machu Picchu is roughly half that time. But there are other considerations. The full train fare from Poroy costs much more than the fare from Ollantaytambo. If you have 3 to 4 people in your party it may be much less expensive to take a transfer from Cusco and then pay the lower train fare for the shorter ride from Ollaytaytambo. This is what our tour company did for our trip, even though we thought we thought we had paid to leave from Poroy. I genuinely enjoyed the train ride and would have preferred to leave from Poroy, especially since we were staying in Cusco. I would have also preferred to return to Poroy on the way back from Machu Picchu. Unfortunately, our tour agent made this choice for us. We had a late train departure from Aguas Calientes to Ollaytaytambo. Our return transfer back to Cusco late at night after a long day at Machu Picchu was exhausting. The only consolation was the spectacular view we had of the night time stars and the Milky Way. Remembering that this was the same night sky the Incas viewed made the trip a little more bearable. I once read from another travel writer that the average tourist spends multiple travel days getting to Machu Picchu, but only spends an average of 3 to 4 hours at the site. His recommendation was to stay overnight and spend two days at Machu Picchu. We took this advice and would recommend it to everyone. You can see Machu Picchu in 3 to 4 hours, but you need at least two visits to fully appreciate it and experience the many things there are to do at the site. We stayed at a very nice hotel in Aquas Calientes at the base of Machu Picchu, and we genuinely enjoyed the town. It is a quirky tourist town that caters to both backpackers and luxury travelers. The town sits dramatically along raging mountain streams at the base of Machu Picchu. The Peru Rail train tracks run down the main street through the middle of town. There are tourist stalls everywhere and many restaurants and bars. It was a crazy contrast to the serenity of Machu Picchu, but also a lot of fun. Machu Picchu takes time to fully appreciate. We started our first day by taking a 2-hour guided tour with a personal guide. It was well worth the time and cost. For lunch we ate at the Sanctuary Lodge. It was expensive, but the food was good and the respite was refreshing. Afterwards, we hiked some of the pathways around Machu Picchu. Eventually it rained and we had to head down the mountain. Unfortunately, we had to wait a full hour in line to get the bus down the mountain from Machu Picchu. Ironically even though it was raining heavily at Machu Picchu, it was not raining down in the valley a few miles away at Aquas Calientes. For our second day, we had secured a permit many months ahead of time to hike to the top of Huayna Picchu. There are only 400 precious permits issued each day to climb to the top of this picturesque mountain. Two hundred for the 7 AM hike and two hundred for the 10 AM entrance time. The climb is strenuous and not for everyone. If you choose to hike, prepare yourself for a 60 to 90 minute hike up steep, uneven stairs carved into the side of a mountain. It is a tough climb in high altitude. If you do make it to the top, you will be rewarded with tremendous views. But this is not the only hiking opportunity at Machu Picchu. Similar views can also be found by hiking to the top of Machu Picchu mountain, as well as the Inca Road to the Sun Gate. There is even a hike you can take to see an old Inca Bridge. Needless to say, there are many things to see and do at Machu Picchu. You will need much more than a 3 to 4 hour visit to fully appreciate the site. Many adventure travelers book two or five day hikes along the Inca Trail in order to get to Machu Picchu. I can only imagine that this is an incredible experience and the true way to see Machu Picchu. There are limited hiking permits available to hike the trail. Also much preparation is needed to be ready for the journey. I would suggest you research your options well ahead of time. You can book excursions when you are in Cusco, but it is well worth thinking through this option and making plans before you arrive in Peru. The goal of most backpackers who hike the Inca Trail is to enter Machu Picchu from the Sun Gate and then hike down into Machu Picchu. Most people do not choose this option because of time, cost, physical limitations, or simply because backpacking is not their thing. But, you can still experience the Inca Trail by reverse hiking from Machu Picchu back up to the Sun Gate. It is a two-hour round trip hike that is not quite as dramatic as the traditional entrance through the Sun Gate, but it is still a reasonable alternative that almost anyone can do. Machu Picchu is the goal, but not the only Inca site around Cusco. It is a good idea to prepare yourself by seeing smaller Inca sites near Cusco and in the Sacred Valley. We visited Sacsahuanan, Pisac, and Ollaytaytambo. These are significant Inca sites that show the building capabilities of the Incas and gave us a good context with which to further appreciate the mastery of Machu Picchu. There are also additional sites worth considering such as the agricultural terraces at Moray and the Salt Works at Maras. After Machu Picchu, we opted to continue our travel overland across the Altiplano to Lake Titicaca. Along the way, there were smaller Inca sites that provided a good post transition from Machu Picchu. All of these helped us to fully appreciate the uniqueness of this area of Peru and the ancient people who helped to establish its identity. Should you enhance your experience by visiting other Inca sites? Machu Picchu is the goal, but not the only Inca site around Cusco. It is a good idea to prepare yourself by seeing smaller Inca sites near Cusco and in the Sacred Valley. We visited Sacsahuanan, Pisac, and Ollaytaytambo. These are significant Inca sites that show the building capabilities of the Incas and gave us a good context with which to further appreciate the mastery of Machu Picchu. All of these questions I listed require you to pre-plan and make decisions before you get to Peru. It is by no means a complete list, but it is a good place to start. Most people who book through a tour agent simply do not realize that they have many different options. Many of the choices I listed will not significantly raise the cost of your trip, but they may have a major impact on your overall experience. I was satisfied with only one day at Machu Picchu but we arrived in the dark and left at dusk. It was an awesome but exhausting day so I agree that others should consider 2 days. Huayna Picchu should be a must do. One of my favorite parts. We didn’t have problems getting same day permits (nearly first in line though) but that could have changed in 6 years. I disagree with hiking the Inca Trail for backpackers. There might be a little magic to entering at dawn through the Sun Gate but that trail is packed with backpacking groups. There are several different trekking options offered that end with transport to Agua Calientes. We did the Salkantay trek and the Ausangante trek sounded even better. Our son just returned from South America and did the five day hike along the Inca Trail. He said it was a beautiful hike and something everyone should experience at least once in their lifetime. 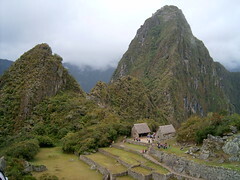 Thanks for the great information and photos on how to and where to on Machu Picchu. Thanks! I was thinking a couple of hours at Machu Pichu would not suffice. You validated my thoughts and this helped me cross off some tours I was considering. how long will it take to get a permit to visit Machu Picchu? I am travelling in May and would like to do the combo with the Wayna Pichu on same day. 2 times are available: 7am and 10am. I struggle to see which one would be best. In both case does it have an overall impact on the time we can stay on the site? I like your blog, on Europe its good but for the errr … Third World you seem a bit to dependent upon tours, agents, and intermediaries. While locals deserve a living, some of this raises prices for locals too and disrupts the local economy. I think you will find both tours and independent travel mentioned for developing countries, but for a lot of Americans a tour is much easier to arrange. So my episodes of the podcast on independent travel in developing countries is mostly by nomads. This looks absolutely amazing and such a great piece of art.Machu picchu can amaze every traveler. Would you recommend to bring the warm hiking gear? Or is this something you could rent there? How you dress for Machu Picchu depends on the time of year that you are visiting. The temperatures at Machu Picchu are warmer than Cuzco, because the elevation is lower. Also, the site is located at the edge of the rain forest. The most important thing is to bring layers of clothing, because the temperatures will change during the day. During the winter months at Machu Picchu (June, July, August) temperatures at night can approach freezing, but can be very comfortable during the day. At other times of the year, the temperature can vary a great deal during the day depending on the amounts of rain and sun. You can definitely rent or purchase hiking/travel gear in Cusco and Aqua Calientes. There are many places that specialize in outfitting hikers with trekking gear. I you find that you have not brought along enough warm gear, you can definitely add more at these locations. If possible, I would always recommend bringing your own gear to make sure that you have the equipment and clothing that is best for you. I am hiking up to Machu Picchu after few months and I can’t wait. I am spending a few days in Cusco before. Any tips or ideas for other fun things to do around there? Thanks Barry! I have been scouring the internet trying to find the answers to some basic questions and you answered them! Thank you!!! I am off to read more of your blog!